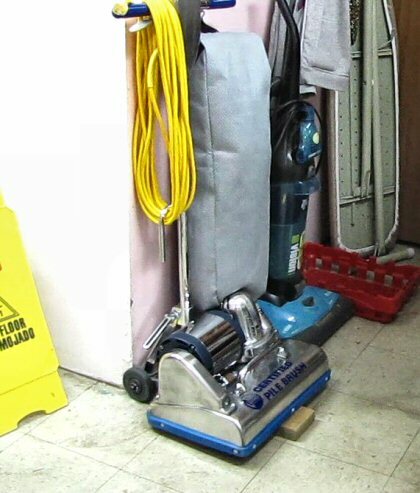 High traffic areas: (Commercial carpet is replaced prematurely not because it wears out, but because it "uglies" out in the high traffic areas). 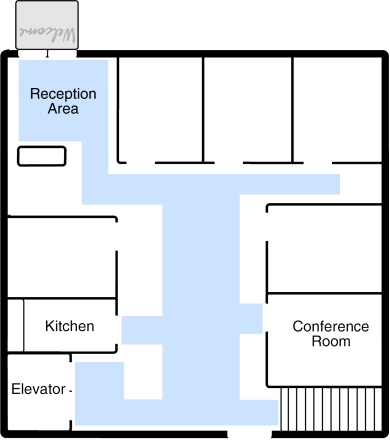 Traffic lanes and heavy pivot areas in hallways and in front of reception areas. Entrances into buildings (80% of soil is trapped in entrances and the beginnings of rooms). The below diagram shows common high traffic areas. 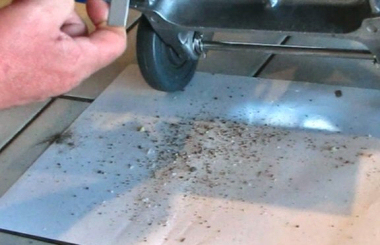 Scope your facility to determine the carpet problem areas. (Use the map above to help determine common problem areas). Firmly grip the handle and hold in on the lever under the handle. To operate most effectively, always start in corner of the area to be pile brushed facing the lay of the pile. The Pile Brush action is complete on the back stroke, against the lay of the nap. Always the first step in restoration cleaning. Minimum of once a week. More frequently with heavy foot traffic and wear. 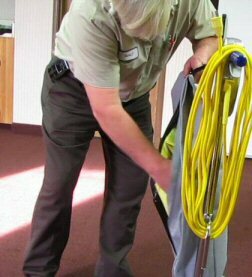 Preventative carpet maintenance saves you money in the long run. Wrap the cord around the handle. Check fill level of the bag. Replace around 80% full. Clean out the sand trap. 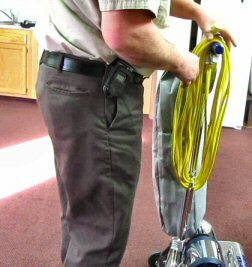 Adjust the Pile Brush handle to a 90 degree angle. Place a wooden block in front of the brush to keep it from flattening out.